This PDF 1.6 document has been generated by ILOVEPDF.COM, and has been sent on pdf-archive.com on 23/08/2015 at 15:19, from IP address 103.5.x.x. The current document download page has been viewed 342 times. File size: 1 KB (26 pages). • In addition, segments can be of variable size (below or above 64 KB). • Some system control instructions are only valid in the protected mode. which accessing 32-bit registers requires the prefix 66h). access rights. This is similar to selecting one card from a deck of cards in one's pocket. function in the real mode will function without change in the protected mode. 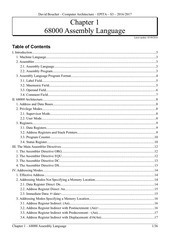 describes the location, length and access rights of the memory segment. allows segments to begin at any location in the processor's 4G bytes of memory. not available (AV = 0). supposed to be a maximum of 64K bytes. Descriptors are chosen from the descriptor table by the segment register. Local descriptors table: usually unique to an application (also called application descriptors). 13-bit selector field: chooses one of the 8192 descriptors from the descriptor table (213 = 8192). Requested privilege level (RPL) field: requests the access privilege level of a memory segment. is higher in priority than the privilege level set by the access rights byte, access is granted. system normally indicates a privilege level violation. stored in memory as shown below. s eg m en t .
registers are not directly addressed by software). (interrupt descriptor table register) contain the base address of the descriptor table and its limit. (but of course, the table could be smaller than 64K byte, hence the need for the limit). segment register is referenced (hence the term cache). time the number in the segment register is changed. levels. The task register allows a context or task switch in multitasking systems in about 17s. enabled with a special new addressing mode, controlled by other bits in CR4. function in both the real and protected modes. number of pages to the program. bits). This means that each page table is 4 K bytes long. This file has been shared by a user of PDF Archive. Document ID: 00297374.